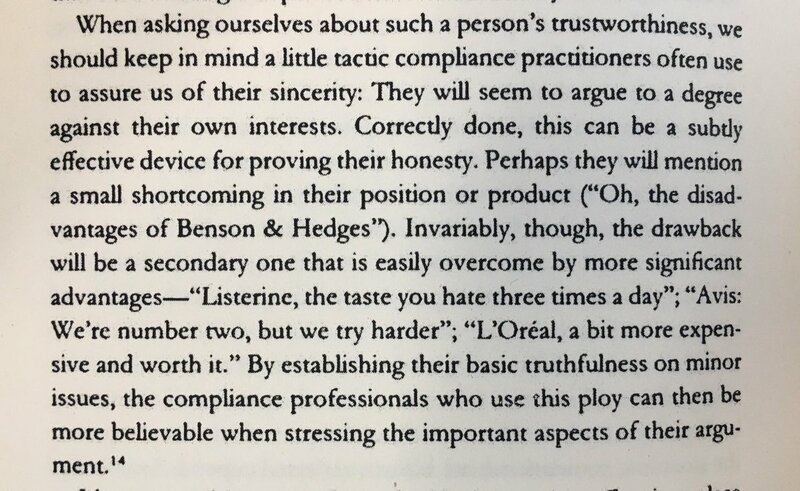 Posts tagged "Benson & Hedges"
When asking ourselves about such a person’s trustworthiness, we should keep in mind a little tactic compliance practitioners often use to assure us of their sincerity: They will seem to argue to a degree against their own interest. Correctly done, this can be a subtly effective device for proving their honesty. Perhaps they will mention a small shortcoming in their position or product (“Oh, the disadvantages of Benson & Hedges”). Invariably, though, the drawback will be a secondary one that is easily overcome by a more significant advantages — “Listerine, the taste you hate three times a day”; “Avis: We’re number two, but we try harder”; “L’Oreal, a bit more expensive but worth it.” By establishing their basic truthfulness on minor issues, the compliance professionals who se this ploy can then be more believable when stressing the important aspects of their argument.